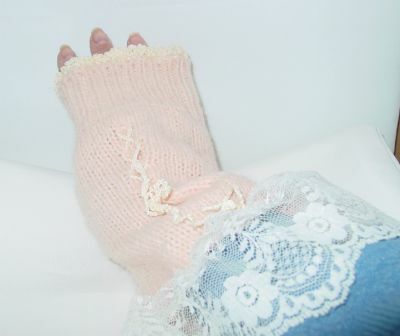 These mitts are recycled from old sweater sleeves. I had two heavy-duty metal rakes, like the kind you use for tilling, not leaf-raking. One of them was ancient, and the wooded pole broke on me one day a few weeks ago. Since I had another one, I repurposed the rake head by spray-painitng it with dull white Rustoleum and tacking it up outside the board-and-batten closet in my farmhouse bedroom to hand necklaces from. I love it! I love the rake idea. I have a ton of necklaces and have not found a good way to organize them. Your idea sounds great. Nicole, what you have there might be an old spittoon. And if it's really copper, no matter what it's original purpose, it's very valuable. CJ -- WOW! That's awesome! It should have gotten into the new MJ issue focusing on Glamping. I had two heavy-duty metal rakes, like the kind you use for tilling, not leaf-raking. One of them was ancient, and the wooden pole broke on me one day a few weeks ago. Since I had another one, I repurposed the rake head by spray-painitng it with dull white Rustoleum and tacking it up outside the board-and-batten closet in my farmhouse bedroom to hand necklaces from. I love it! I had two heavy-duty metal rakes, like the kind you use for tilling, not leaf-raking. One of them was ancient, and the wooded pole broke on me one day a few weeks ago. Since I had another one, I repurposed the rake head by spray-painitng it with dull white Rustoleum and tacking it up outside the board-and-batten closet in my farmhouse bedroom to hang necklaces from. I love it! Aluminum siding, license plates, baling wire . . . and fun stuff! I made myself a new bag out of my husbands old jeans. I used the back pockets as inside the bag pockets and the waist pockets as the sides of the bag. I used the strap from my old bag that had fallen apart, and an old quilt that I had started and never finsihed as the front of the outside of the bag. I love it and it is so sturdy! Sarah, your bag sounds very nice. This isn't that exciting, but I am re-organizing my kitchen as the cupboards get painted. I re-used a canning jar box for a drawer organizer (for cell phone charging cords). I made a birdbath from a large pot and saucer, and a birdfeeder from a cappucino cup and saucer, using MaryJane's directions from her "Tips of the Week". I think it first posted last August. I knew I could do something with this. I finally settled on asking Dave to build a cedar, "culled" wood cabinet of sorts, for our deck. It would add more storage, and get rid of our ugly white plastic shelf (left over from the first pantry closet attempt). I thought we could put our various barbecue and gardening stuff in it. It would age nicely, with the cedar top and sides. I asked Dave to leave the back open since it's up against the house, but he had to stabilize it. Since the wood was "culled", misshapen, split, etc., it was only about $5.00. Pretty cheap! For this kind of project I just wanted to keep the price down and be creative. Here's the "after", works great! Oh how cute is that Nancy! A Friend is Someone who Reaches for your Hand, But Touches your Heart! Oooooh, Nancy! We got new windows and I saved the old screens. I will be trying this for sure! Prayer costs nothing, but is worth the most. I was SOOOOOOOOOOOOOOOOOOOOO HONORED when Carol at MaryJanes Farm asked if they could include the photo of my license plate sign in the newest edition of the magazine. On page 10 of the new Aug-Sept. issue. Thank you MJ and Carol! I couldn't stop giggling at your cat food tea kettle. I can just see out two trying to get the top off to get the goodies. Great idea!. Thanks for sharing. I went to a workshop that upcycled jars/tiles/sweaters. Well it's not an original idea, but I've been saving all my pop-top tin cans for Christmas to stick in stockings. I open them from the bottom, use the contents, wash them out, fill them with wrapped candies, glue the bottom shut, and cover them in Christmas paper. I got the idea from this website, and I think it's a great, creative way to reuse before recycling. I had three dresses with smocked tops that didn't fit very well (I guess smocking isn't a good look if you're chesty), so I remade them into skirts.